"I can't start that project because I don't have the words to write." "Oh that song idea? I'll start when I get the new piano I always wanted..."
Have you found yourself spewing some similar sentences? Or maybe you've found yourself googling haphazardly at the midnight hours, desperately searching for an easy-breezy solution on how to get that creative thing even started? We need that jolt, the hit, the magical moment to start our creative adventure. That secret moment where the wave of inspiration hits and the song 'Going the Distance' plays dramatically through the air as birds twirl in non-sensical speed creating a magical moment of whimsy. When does THAT moment happen? Newsflash sister-friend/brother-from-another-mother. It most likely WON'T HAPPEN! Before you give me mega "booooos" through the computer screen and think "who brought the buzz kill?!"... let me explain. If you've hung out with me longer than 5 seconds, you know I believe you're created to create. You are meant to live a creative life and influence the culture around you! However, studies show as our age increases, our creativity decreases. So as we sit the bench on the sidelines waiting for that PERFECT MOMENT where the stars align and this wave of inspiration hits... your creative muscle get's weakened.... and for some, even lost. 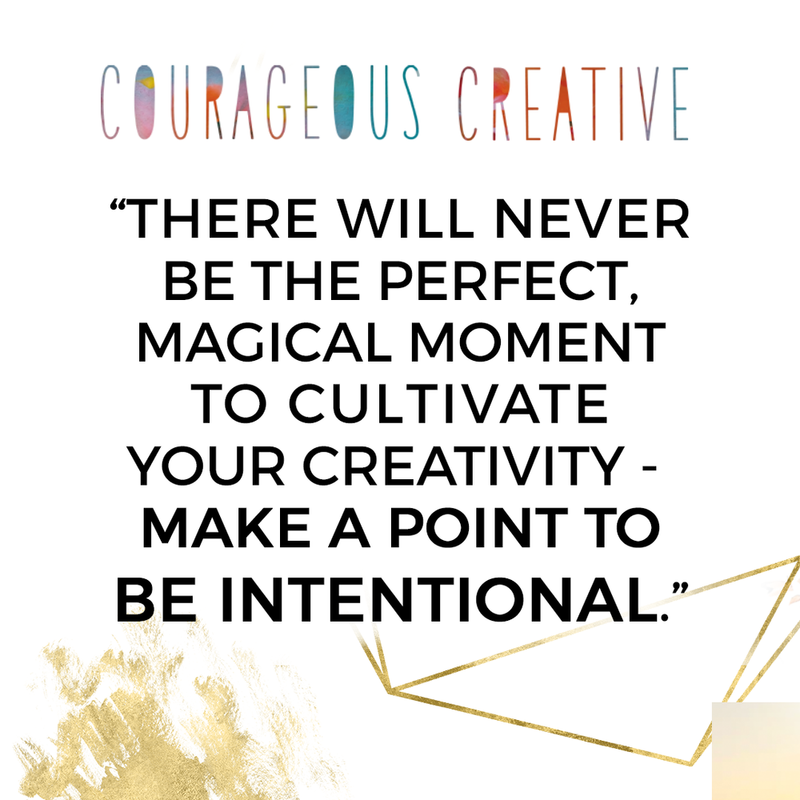 So what's the #1 perfect and magical moment to cultivate your creativity? That's why YOU ARE A COURAGEOUS CREATIVE! Courageous to start, when you don't know the outcome. You're courageous to sacrifice your time to cultivate a hidden talent or passion. Courageous to chase after your God-given creativity, even when you've faced rejection, defeat or embarrassment in the past. Your creative process may NEVER feel perfect, or super-magical. Although I know sometimes Holy Spirit does start with a BANG of inspiration! But when it doesn't start that way, and it feels clumsy and you feel exposed - be okay being comfortably uncomfortable. All you can do is start doing, and trust for Divine inspiration in the process. You are a courageous creative who is intentional to cultivate whatever that creative project is in this season. If it's writing - write on. If it's painting - find some canvas. If you want to freestyle rap - let me hold that mic. BE INTENTIONAL TO CREATE. Stop limiting your abilities and start believing that the magical moments are found IN the creative process. There's NEVER a perfect time to create - except right now. There's beauty to be found. Happy Creating, you creative ninja, you! Looking for a creative, interactive devotional? Look no further! Courageous Creative is a book WRITTEN FOR EVERY PROCRASTINATING DREAMER AND WOUNDED CREATIVE. INSIDE YOU'LL FIND 31 days of creative challenges, lessons and advice from LEADING INDUSTRY experts IN THEIR FIELD. IT'S NEVER TOO LATE TO CREATE! Click the button and order today!